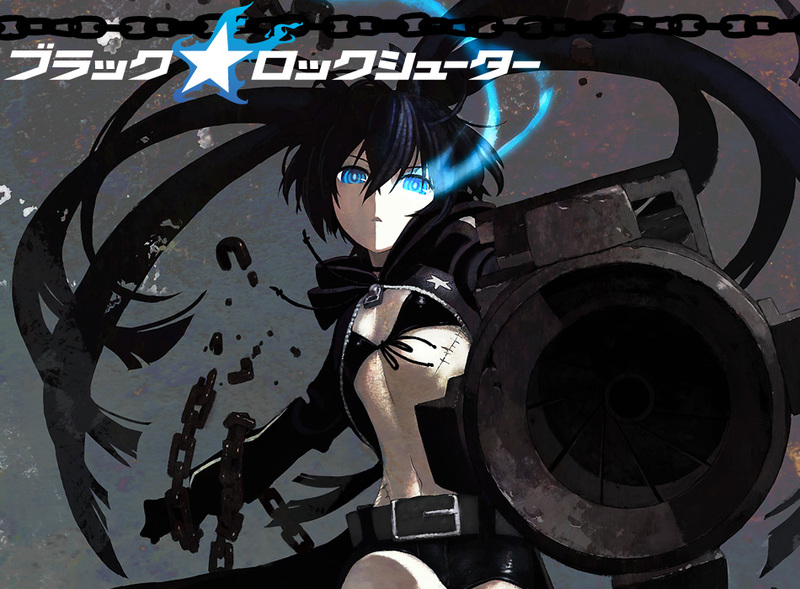 Black rock shooter~~~~! 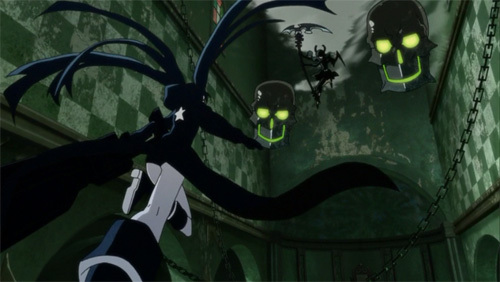 Enter one of the sexiest anime characters in anime history, the black rock shooter! Originally a song from hatsune miku, it gained a ton of famed and eventually was made into an anime due to huge popularity among fans. While it is a something that fans want, it gets great reception and almost everyone who watches it dubs it as a godly anime thats better than many other animes out there. Well, I understand, it was greatly hyped before it was released. Personally, heres my opinion. There are no opening songs for the OVA, but there is an awesome ending song. The ending song is braveheart, and its sung by the gomband. I seriously thought they were going to use a hatsune miku song for the ending, you know, it being black rock shooter and all. But they didnt, they even got a guy band to sing it! Great stuff, definetely, and the song being so damn rock-styled helped even more. A great rock song with heavy, fast and addictive beats, definetely worth a listen! Heres the deal, BRS is overrated as an anime. Viewers keep saying it is awesome, but is it really? Really it only deserves a 7 at best, Im being quite linient here. I mean sure, the animations are top notch, and the fight scenes are nothing short of awesomeness. The main story concept is alright, but there is a lot of cutting between the fighting and the main storyline conversations, making it hard to really focus on one thing. Its like, 2 mins of talking, cut, then 1 minute of fighting, cut, then back into talking. Its abit...weird, to say the least. While you can easily understand the story, its get quite predictable. Still, as mentioned, fighting scenes are very solid. Things really heat up during the action scenes. The main character the BRS is kuroi mako, your run-of-the-mill average highschool girl. She enters a local high school as a freshman and meets another girl, yomi. After a short intorduction, they become good friends. They spend time together after school like best friends and soon it becomes routine. On the other hand, we see another alternate dimension, with 2 girls battling out against each other. One is the black rock shooter herself, while the other is the death master. These 2 ladies battling each other strongly resembles the two best freinds in the real world. What could this all mean? I wont spoil further, but thats the gist of BRS, its a tale of two friends, and a really badass fight that stretches throughout the whole 50 mins. BRS is quite overrated. It had the potential to be better, really, but the cutting of the action scenes into talking scenes can really turn viewers off. The action is great, so is the voice acting (Kana hanazawa ftw). The story is only average and can be predictable, but its really the cutting of scenes thats the problem. All in all, if you're really into BRS, give it a watch. If you're just curious, give it a spin, its only a 50+ minute OVA with only 1 episode, though Im pretty sure another one's coming, since it got announced at AFA 2010.